The Society has had a very busy couple of months with the Annual Exhibition in August and the Annual General Meeting and election of a new committee for 2018-19 in September. Thanks to members’ contributions, the exhibition was hugely successful attracting over 1500 visitors who generated many interesting questions and enquiries. A number of visitors also donated or loaned items of considerable interest; all of which add depth to our collection and to our understanding of Inverloch’s history. It was delightful to meet people, to talk, to listen, and to get more information about our town. Some of the photos donated or loaned may, on the face of it, appear to be of minor significance, however, this would be a serious underestimation. When we patch together new items or information with what we already have and know, a bigger and richer picture emerges and our view of the whole becomes that much clearer and fuller. Even private family photos can be important historically, perhaps because of the roles the individuals have had, or will play, in the town’s history or, sometimes, because the background provides clues to something lost or altered, especially when a next generation, or new owners, take over a site or building and connections begins to fade. 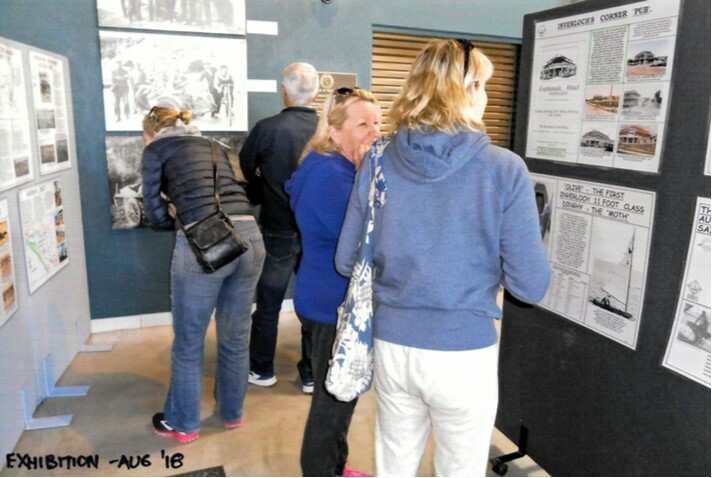 Visitors enjoying the Society’s 2018 Annual Exhibition staged at The Hub, A’Beckett Street Inverloch during August. Yet again, many visitors talked about the changing coastline, with the sand moving around dramatically. Inverloch Surf Lifesaving Club has had many problems over the past two years because of coastal movements and their watchtower is once again under threat. This is a group of volunteers, who gladly give their time and expertise to the community, now under enormous pressure from the elements. A photographic record of the many changes, not only affecting the Surf Club, but many parts of Inverloch’s coastline, is important and something we need to build on. “To add to the various troubles of the (Foreshore) Committee, that of foreshore erosion began to become serious in 1930. Prior to that date, the erosion that had been taking place was more or less normal, but by some strange freak of nature this year, the extremity of Point Smythe began to rapidly wash away, and within the space of two years at least half a mile of this peninsula, which had formed a natural shelter for the beaches on the Inverloch shore, had completely disappeared. From then on, when rough seas occurred, the ocean rollers pounded in on the main beaches, with the result that sand and vegetation began to rapidly etc. (sic) of its heavy growth of ti-tree, ample supplies of wood and fresh water, and, not at all least, its freedom from dirt and waste. Inverloch boasts a beach which is among the cleanest of our coasts and the safety of bathing in the shallow surf of the Inlet commends itself to the holiday maker”. The Foreshore Committee’s reference to “supplies of wood and fresh water”, relates to concern for campers at a time when they occupied much of the foreshore near the town over the summer holidays. It was not, for them, a concern for the environment, but for the convenience of campers. The reference to Point Smythe decreasing in size has frequently been echoed by long term residents across the years. The Society welcomes old brochures, pamphlets and old information sheets as well as objects, photographs, documents and maps. They can appear ordinary, but believe me, they represent valuable historical records. The AGM included reports from the President and Treasurer. If you missed the meeting and would like to receive a copy of these reports by email please contact the Secretary. Members Bob Speed and Patsy Williams were inducted as life members. Patsy and Bob are both long term members and dedicated volunteers; Patsy is also a past Vice President. On behalf of all members, the President thanked Patsy and Bob for the support they have provided to the Society and congratulated them on their awards. After many years as a committee member, including lengthy & valuable service as a past President, Vern Burchett has decided to stand down from the committee. Vern was honoured in absentia with a Certificate acknowledging his contributions and achievements. On behalf of all members, the President thanked Vern for his dedication to the objectives of the Society and congratulated him on his award. All committee positions were declared vacant and an election conducted by member Ruth Glare. The members elected to form the committee and manage the Society for 2018-19 are: President— John Hutchinson, Vice President—Ian McBurnie, Treasurer—Rosemary Hutchinson, Secretary—Lynn Kirk, and members—Terry Hall, Lloyd Bennetts & Ray Burtt. Patron Eulalie Brewster is also a committee member. President John Hutchinson noted that the outgoing committee has recommended the introduction of a sub-committee structure with each sub-committee chaired by a committee member. The recommended sub-committees are: (1) Exhibitions & Promotions; (2) Collection Management & Research; and (3) Museum Site. These recommendations will be considered by the incoming committee. 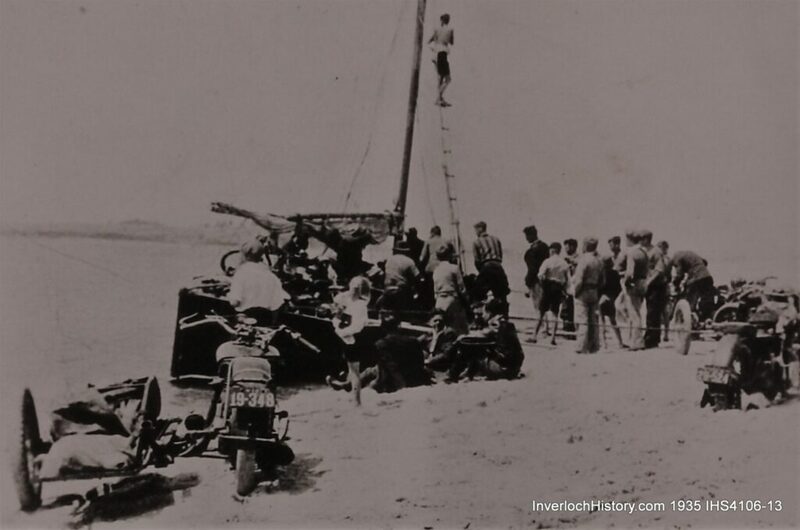 Below is the cover of the programme for the 1936-7 Inverloch Carnival. The Society is delighted to have added to our collection a facsimile of the original program loaned by Eileen Henderson of Inverloch in August 2018. Among many fascinating photographs, adverts and items of information are details of the prizes for the Miss Inverloch winners including: a ladies Austral bicycle, a ”Permanent Wave” from “Mr Greg Hair Specialist”, Best Beau Monde Hosiery, a “beautiful handbag” from Rowlands’, and a “gold wristlet watch” from Richards Jeweller. Hopefully, the booklet will soon be available to view online. 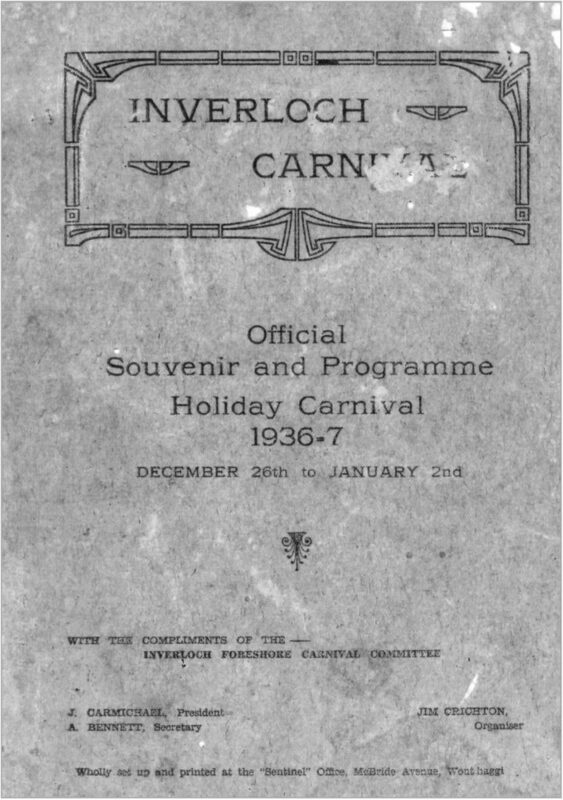 The cover of the programme for the 1936-7 Inverloch Carnival. The Society’s financial year ended on 30 June 2018 and membership subscriptions for 2018-19 fell due from 1 July.